When Emma Baker went into cardiac arrest during a school spelling bee nearly five years ago, her family had no idea she had heart disease. Thirteen-year-old Emma, of Rose Hill, spelled her first word and returned to her seat. Then the next speller stood up, and Emma fell over onto the girl seated next to her. Emma was making snoring noises, but she wasn’t asleep — she was in cardiac arrest. The school’s principal, a former firefighter, knew immediately that Emma was in medical distress. He began CPR, and a mom in the audience gave Emma rescue breaths. Firefighters quickly arrived from a new fire station that had been built on the same block as the middle school. They took over CPR until emergency medical technicians arrived. Those three sets of people performed CPR on Emma for 45 minutes before her heart started beating again, Emma’s mom, Kate Baker, said Tuesday. After Emma’s cardiac arrest, she and her family — including her older brother, Matthew — became certified in CPR, and now they are passionate about teaching the skill to others. 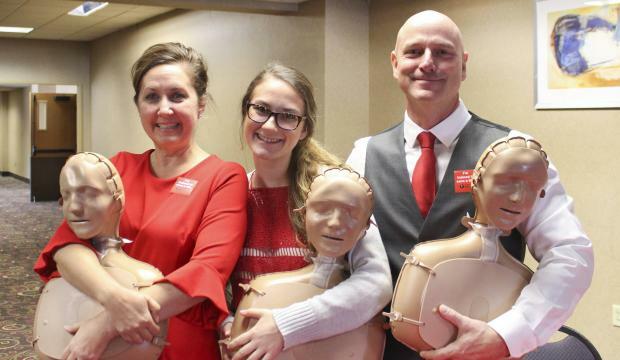 At the American Heart Association’s Go Red For Women Luncheon at the Capitol Plaza Hotel, Kate, Emma and Scott Baker, Emma’s dad, showed participants how to perform hands-only CPR. Emma, now 18, has catecholaminergic polymorphic ventricular tachycardia, or CPVT, which means her heart doesn’t like adrenaline, Kate said. She has an implanted defibrillator and pacemaker, which shocks and paces her heart, and it has shocked her twice: once while inner tubing at a lake, and once when she was dancing alone in her room. Emma also takes heart medication, and she underwent surgery to cut off some nerve endings in the spine that send adrenaline to the heart. She returned to cheerleading as a high-school junior, and she also has tried horseback-riding and ziplining. While sharing Emma’s story with a reporter, the Bakers learned the Kansas State Board of Education had unanimously approved adding CPR training to its model standards for health education. That means CPR certification will be required in order for Kansas high school students to graduate. Emma spoke before the board in July on behalf of the requirement, which is already in place in 37 other states and the District of Columbia. Kevin Walker, regional vice president of advocacy for the AHA, attended the board of education’s meeting Tuesday and said the heart association is supporting the education effort. Kansans have generously supported the AHA and its mission, he said, and it was important to the AHA to give something back. It has committed to providing about $25,000 worth of training kits. Walker said he was excited that the efforts will train a generation of lifesavers across Kansas. Nearly 33,000 students will be trained in CPR across the state next year, the AHA said. According to the AHA, more than 350,000 people experience cardiac arrest outside of a hospital each year in the U.S., and about 90 percent of those victims die, often because bystanders don’t know how to start CPR or are afraid they will do something wrong. CPR, especially if performed immediately, can double or triple a cardiac arrest victim’s chance of survival. Kate said Emma began advocating for CPR training about a year after her cardiac arrest, after a Winfield High School cheerleader who was Emma’s age went into cardiac arrest during practice and died. If not for the spelling bee, Emma would have been at cheer practice the day she suffered cardiac arrest. “To see what could have happened, I think, it really hit home to her,” Kate said. Emma is a freshman at Butler Community College and wants to be an accountant. She plans to choose a college farther away from home to attend next year, and Kate admits it is scary, even though she wants Emma to live her life. She first spoke about CPR to her middle-school physical education teacher’s class, where she was speaking to kids she knew. The next year, when they moved up to high school, some of the kids told her they went on to learn CPR because of her. She later talked at high schools, including Norwich High School, where a senior class involved the whole town in learning to handle health emergencies. Local EMTs and firefighters taught teachers, students and others the Heimlich maneuver and how to run a defibrillator, and the Bakers taught hands-only CPR. Emma’s story helped set the stage for the CPR certification plan’s approval by the state board of education, Walker said. He said board and staff were “hugely supportive” of the plan. The Kansas Association for Health, Physical Education, Recreation and Dance, an association that supports PE teachers and others who will doing much of the training across the state, also supported the measure, Walker said.